Victorian London and somewhere from within the gloom of the swirling mist, a muffled cry is heard followed soon after by the sound of running feet. It's nearly midnight and most honest folk have long since taken to their beds. Thus the scene is set for another Sherlock Holmes adventure and in this latest version of the classic Sherlock Homes detective game, there are seventy-five intriguing cases to be solved. 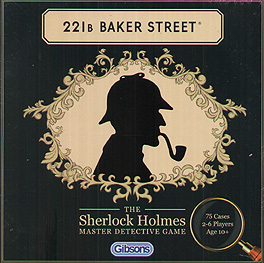 At the start of each game, the details of the case will be read aloud and you will then use your powers of deduction to solve the case and return to Baker Street with the correct solution. In your turn, you will move around the streets of London in any direction you choose, visiting various locations where you will collect clues, some of which will be cryptic, some will be factual and others may be misleading! The game is packed with opportunities to obstruct and outwit opponents providing 60-90 minutes of thought-provoking entertainment for 2 to 6 players.